John Edwards Talking about His Affair? 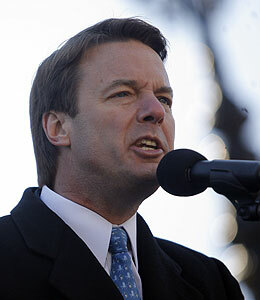 Is former North Carolina Senator and self-confessed cheater John Edwards talking publicly about his infidelity? That's false. The disgraced Democrat did come out of hiding for a speech at Indiana University last night, but didn't address his affair with filmmaker Rielle Hunter. John's wife, Elizabeth Edwards, recently appeared in Washington D.C. to discuss changes to the country's health care system -- and was photographed without her wedding ring.